Previously, he recorded that 95-98% humidity in the headspace was high enough to ensure the passage of phenolics as well as taints from the cork into the wine – which would explain the presence of cork-derived TCA in a wine that had been stored upright. I have never believed the claim that we store wine bottles on their sides in order to keep the corks moist – it simply dosen’t make sense. . As Dr Cabral says, the headspace humidity will do that perfectgly well. I assume we store them thus simply because it is, for most purpsoses, the most practical. For reasons of both space utilisation and accessibility. Perhaps then, producers will end the practice of storing palletized cases in the “necks down” orientation. It’s an idea worth exploring as there could be some labor/time savings by not having to flip the case over before placing it on a pallet. Multiple cases of first growth 1966-68 wines were stored in proper conditions (55-60F) upright; all the corks dried up,shunk, idk but ended up falling into the bottles causing all the wine to be oxidized…..
Perhaps producers can switch from storing palletized cases in the “necks down” orientation to “necks up”? It could be a time and labor saver. To move the discussion down the bar menu, does this cork moisture observation also apply to spirits? Actually when you have the force of the liquid on the cork you have less air transfer in to the wine. Several research papers have shown this to be true. They actually measure the rate of transfer. over time and the effect of oxygen on the wine. Also I have stored wine for in excess of 30 years in my cellar and some were up and they lose elasticity and the wine goes bad after about 8 to 10 years. I have some where the wine cork crumbles upon opening but the wine is good. When you have 100% humidity on one side of the cork and much less humidity on the other side the moisture transfer goes out from the cork unless there is some sort of seal like wax. Any wine stored upright for a long time, not a short time like 5 years will have the wine go bad much faster as the drying effect from outside the bottle takes place. Best storage time is actually having the wine upside down in cases, so the full force of the liquid weight is on the cork and less exposure to air on the outside of the bottle as it is sitting on the cardboard base of the box. Also what ancient wines that have been found to be still drinkable have been found either in cellars that have been found virtually buried with no air flow, also buried in the dirt as an old practice in some ancient wineries or in sunken ships. The actual physics of what he is putting forth make no sense and is not the way the world and nature works. There is always transfer of situations and conditions when there is lack of balance on both sides of a medium and the flow will not likely be consistent. Similar to the the laws of thermodynamics the second one in particular. What he is proposing is impossible unless the cork is inert to moisture. I was having an “is nothing sacred” moment until I read your rebuttal. Thank you for restoring sanity to this debate. Having been to several port wine cellars in Vila Nova de Gaia since 1986 and even in the private cellar of the Symington’s the dominating Port shipper – I can report that every bottle was lying down. My guess is that they have generations of experience with the interaction between cork and Port. Personally I have experienced several Port bottles from Portuguese wineshops – that keep their bottles standing – which were dried out in the center and almost impossible to remove without cracking in several pieces. So I will still keep my Port on the side. As a wine producer Buy good corks first of all what is the cost for them? Minimum $35.00 per 1000 for a good quality. When installed there should be zero air pressure between the cork and wine. We Store neck down at 70 deg. F and after 10 to 15 years we see the condition of the corks to be excellent to satisfactory for a 35 cent cork. Hello Mr Trotta. Bonus to storing on side: Decanting is more thorough when the deposit is opposite the label and the bottle is poured allowing the bubble to disturb only the surface away from the sediment..
Capillary action must be improved with upside down pressure on the liquid side.. Cork rate of decay also has much to do with the actual cork quality. We wax our Fait Accompli for extended cellaring. “After my wine was bottled with natural cork closures the bottles were left upright instead of inverted, is this standard practice? So why does the wine oxide easily stand up ? Did the study actually involve only 2 bottles????? Is that what I read? While there is plenty of headspace moisture on one side of the cork, the other side is subject to whatever ambient moisture exists. Those bottles stored in environments devoid of enough ambient moisture are doomed to poor storage. I was recently made aware of just how important environmental moisture is to lomg-term-storage when a cache of my 27 year old wine was discovered in an environment so moist that the labels wad deteriorated due to microbial action, the cardboard packaging had lost its structural integrity, and the capsules had become discolored and ugly. Unlike similar wines subjected tom my storage conditions, which universally exhibited crumbled corks and oxidized wine, though the bottles lacked ullage, many of these bottles had plump corks with structural integrity, and qiality wine inside, though still exhibiting the flavor profile that would be expected from a quality 1990 vintage red. The wines are good enough to be currently sold. Clearly, headspace moisure does not translate by itself into intact corks. What is the best ambient humidity in storage that will optimize both cork integrity and packaging integrity? Having attended literally hundreds of wine auctions, and examined many thousands of bottles, I can categorically state that this theory does not withstand practical scrutiny. When old bottles come to auction I look at the dust deposits to ascertain whether they have been stored upright or horizontally. Over a limited period, ten years perhaps, it’s no big deal which way they have been stored, but over greater periods, upright storage is really bad news. The corks of such bottles start to shrink or become crumbly – they often fall into the wine and they are also much more vulnerable to attack from furniture beetle. Humidity alone is not enough to keep a cork adequately hydrated. While I completely understand the reasoning behind most of the comments disputing this study, I believe among the many missing-links, perhaps the most significant is the quality and size of the cork relative to the opening in the neck of the bottle. I have stored wines (with great quality corks) upright for decades in a temperature controlled environment (however with ranging humidity levels) and every single bottle that I have opened has a perfectly preserved cork. Furthermore, you can easily see the moisture from the head-space of the bottle permeating the cork and maintaining the integrity of the cork from end to end. Of course, I’m not disputing anyone else’s observations, I’m just suggesting that there are a multitude of variables and that if a great quality cork, of the right size/fit (diameter and length) is used, and temperature properly controlled, that indeed such bottles may be stored upright for DECADES and the integrity of the wine inside (as well as the cork), perfectly maintained. I was in Porto last month and have pictures of bottles of port in Graham’s cellar, the oldest dating back to 1868, every single bottle… you guessed it, laying on it’s side. We were told they replace the corks every 30 years. The report starts with the quotation “The cork will never dry out with almost 100% humidity in the headspace…”. This is unsupported by evidence here, and is wrong. The phrase ‘almost 100%’ appeals to the emotions, implying a sort of Turkish bath, but a bit of science shows its weakness. Relative humidity above the wine at 15C is about 1.5%, so the air is actually very dry. Boiled cork has about 8% moisture content so the airspace is drier than the cork, and will not keep the cork moist. A damp cellar might then help if the bottles are stored upright (though the capsule may prevent this). Sideways storage is definitely correct. The percentile moisture content of the cork will not relate exactly to the percentile moisture content of the air – much depends on the extent to which the cork is hygroscopic. A typical wine bottle cork weighs about 3g including (when young) about 0.25g of moisture. 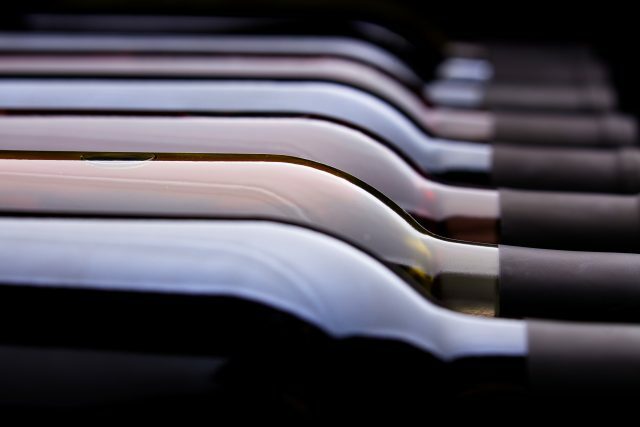 When laid on its side, a young wine bottle with a sound cork loses around 0.05g to 0.1g of weight through fluid evaporation through the cork each year. Without full contact with the wine, that weight loss gradually dehydrates the cork and provokes aerobic decay, as humidity alone from within is not enough to replenish it. May I point out that quality cork is impervious to liquids and gases. A good natural cork will not ‘breath’ when intact. The surface between a cork and the bottle is the ‘leak’, especially when the cork starts to ‘shrink’ or lose its elasticity. Continuous wetting over a long period of time, however, causes eventually a decrease of the material’s permeability to liquid and gases. Hence, long term horizontal or level storage (with the wine wetting and deteriorating the structure of the cork) is likely worse than upright storage. I refer to findings by Pereira, H. (2015) The rationale behind cork properties: a review of structure and chemistry. Most of the wine I buy has screw tops. Now wait for the wine snobs to chime in about how awful screw tops are.